Critter Oil® was designed to be the ultimate, most versatile, and safest skin, coat, and environmental care product on the market today. 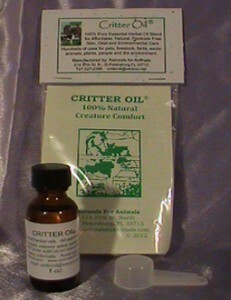 By combining Critter Oil’s® 100% natural, essential herbal oils, with common household ingredients, using the simple, “do it yourself” instructions in the package, and here on this site, you no longer are paying top dollar for 97% inert ingredients (the sudsy stuff, water and other carrier agents). Critter Oil® does it all and replaces HUNDREDS of dollars worth of other products SAFELY and NATURALLY!! SO MANY USES…SO LITTLE COST! Shampoo & Spray: Stop itchy, smelly, painful skin irritation even in hot summer months. Several of the oils in Critter Oil® have natural anti-fungal and anti-bacterial properties which help eliminate skin damage from insect bites, allergies, staff infections, fungal infections, mites, rashes, etc. Clients have reported that the spray formula also removes grease, oil and crayon marks. Coat Conditioning, Color Enhancing and Whitening: Critter Oil® absorbs into the hair (it doesn’t just coat it) making it beautifully conditioned by enhancing its’ naturally silky texture and making it absolutely glow in the sunlight. It eliminates the need to purchase medicated shampoos, color enhancing and whitening shampoos, and conditioners. Carpet Powder and Other Home Uses: Using Critter Oil@‘s carpet powder formula makes your carpets smell fresh and clean all year round, and used in your mop water, will help clean and disinfect floors while deterring unwanted bugs as well. Many clients have discovered that when used in a refillable plug in air freshener bottle or in a reed oil diffuser, Critter Oil® makes being outdoors on summer days and evenings comfortable as well as freshening the air. In today’s economy and with the new understanding of the dangers of chemicals to the health of people, pets, and the planet, doesn’t it make sense to try Critter Oil®? Critter Oil® was formulated with the help of a PhD Organic chemist who made sure that each oil was carefully selected for safety. All are considered G.R.A.S. (Generally Recognized As Safe) by the human cosmetic industry. When used according to any of the directions offered in the instruction sheet, the oils are used in levels well below any individual harmful level for people or animals. For that reason it is safe to use on babies, and pregnant or nursing mothers. Because of the nature of essential botanical oils whose properties will vary slightly depending on the time of year and the region harvested, the color and scent of Critter Oil® may change slightly from batch to batch, but unlike other natural products, each blend is used on animals groomed in their own facilities before being bottled and sold to the public, to ensure its consistency of quality and effectiveness. For All of the Uses and Directions for Critter Oil CLICK HERE!